Contemplation seems to be the story I tell in my paintings and drawings. The idea of thinking, internalizing, grasping, understanding, and gleaning wisdom from something always end up epitomizing my image. My hope is to leave plenty of room for the viewer to add his or her own thoughts to what I have started as an impetus to the mysterious world of images. The creative mind wants to solve a problem, build a structure, form an idea, find an answer. The creative idea sometimes leads, sometimes follows, a course both direct and convoluted. Sometimes my struggle is apparent, sometimes disguised. The birth of a new image reveals the forming of a new story, told in a new language, a fresh eye, a new hope. Throughout my life, my work has been influenced by countless sources and discoveries. Although it has evolved, it has curiously stayed consistent. The subject of the human form has always intrigued me, and has provided the most inspiration. It is complex and yet beautiful, expressive in countless ways. This fascination most likely began in the classical ballet classroom at a young age, having nothing to do during hours of rehearsals but watch the more sophisticated dancers fly around the room. In the 13 years that followed, experience in ballet allowed me to gain a deeper understanding of how anatomy functions while attempting to achieve the unnatural, greatly aiding in my drawing ability. In more recent years, I had a moment of clarity when discovering the world of fashion illustration and design. Again, this challenged the human form, but in a different way. As the fashion industry moves commercially faster and is dominated by photography, I have chosen to meditate on the idea that illustrating is just as important as the three dimensional designs themselves, that the classic idea of one being the counterpart of the other holds indistinguishable value. I seek to give breath to my images by abandoning rigidity, letting the medium used dictate the outcome and personality of the piece. Figures and garments do not upstage one another; they are depicted as they are in real life, expressions of the soul within. I have always been compelled to study objects in my exploration of the unforeseen. I am in constant search, through the love and act of photography itself, to create a world of personal vision. I have found freedom in photography within the depths of seeing, while I continue to build knowledge of perception and idea. In “Embodied” I have established a narrative using wax paper as my focus to build dimensional and textural figures. 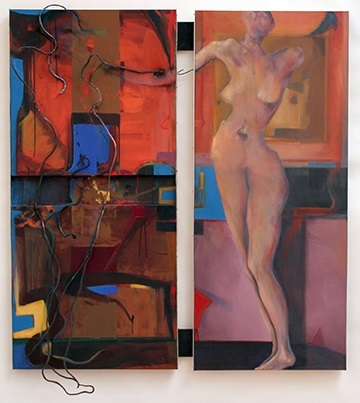 Each figure embodies a powerful visual connection to the human body with an organic presence, while also staying rich in organic material. In these figures are compositions of abstracted material, shaped, formed, and photographed. By using digital techniques to sculpt the final image, each finished photograph has an average of fifteen different photographs combined, resulting in highly unique and high resolution pieces of artwork.